A few words about alternative energy. Some of us think alternative living maybe comes first. Greentech is a hot topic, but the unglamorous fact is that using less stuff will generally give you the most returns. Beloved and I are currently residents of that worst of all worlds, empty-nest suburban two-car commuting. Yes, we're working on that, but, with middle-class outgo, deliberately or otherwise, calibrated by our industrial/consumerist society to stultify downwardly-mobile home innovation, it's been slow. Like the rest of our generation, we've aged, and age seeks the line of least resistance. Economic comfort and personal-environment comfort being closely related. T'wasn't always so for us. Low-energy low-tech living is practiced by most people on the planet, and it's something Norteamericanos can re-learn if they have to. If you are young, or if you have an extended family, it's not all that difficult. 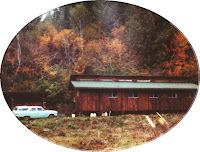 In the late '70s and early '80s the Bear Family lived on twelve acres in the middle of the Coast Range here in Oregon. We didn't have our extended family with us, as is often the case, but we were young. So we built our homestead for off-grid living. We had a friend level off a platform on our hillside, with lots of eastern exposure, bought some pier blocks and a lot of 4X4s, 2X10s, 1X12s and the like, and assembled several structures. The largest was a 24'X48' double-loft house with almost 1400 square feet of floor space. Most of the construction was done with an 18" level, a chainsaw, a brace-and-bit, a hammer, and a 9/16" socket wrench. The lumber for this house came to, at 1979 prices, less than eight thousand dollars. Needless to say, the county building code would not have permitted this. But it got through an eighty-mile-an-hour windstorm without a scratch, and kept us warm and dry, and two children were born there, so I'd say it was a good home. We were several miles off-grid. Sanitation was provided by an outhouse. We piped in water from a springhouse with a pitcher pump at the sink, cooked with a propane stove and a wood cook stove, refrigerated with a propane refrigerator and also in the spring house, and lighting was 12 volt, with propane and Aladdin lamps for backup. Clothes could be washed in a tub. When the kids came along, we added a washer that ran on a gasoline generator. We raised much of our food, which we still do, but also canned a lot, which we haven't had the "time" to do for many years. Our transportation provided the structures with juice by means of a storage battery on site, coupled to golf cart batteries in the car, which were charged whenever we went anywhere by a RV dual-battery switch. We wired the house with heavy-duty solid core wiring suitable for running DC 50 feet or more, and spot lighting was provided by 1/2 amp car taillight lamps. For lampshades we used carved-up gallon milk jugs and the like. They worked fine. For ambient lighting we waited for daylight or moonlight. That worked fine, too. Our skylights were insulated horizontal windows, facing east under the clerestory provided by a double shed roof. Besides the inefficient but rather appreciated washing machine, our one real luxury was a freezer kept at a friends house, for which we paid a small rental to cover the electric bill. The county did discover us, but was disposed to adjust our tax bill for "agricultural sheds" rather than for a home, which was fine with us. When we sold out and moved away, for what seemed to us good reasons at the time, the new owner changed over the twelve volt system from automotive to solar, but otherwise kept things the same for eighteen years. When she decided to replace the main house to meet code, she was able to recycle all the original materials into the new structure, as we had used lag screws throughout, to enable waste-free dismantling. I don't know how "green" our footprint was -- I worked in forestry, and had to commute great distances in order to run a chainsaw for a living sometimes. But I do know that life was an adventure that we were able to live to the full, at an annual family income of some ten thousand in 1980s dollars. At Stony Run we keep hoping to re-learn some of the things we knew then. If anything worthwhile comes of that, you'll be the first to know. For those (about six) who've asked about putting homecomings in print, I've done so; find the link in the sidebar at right or click on the image of the book. It may be of use to people. Having gone back through it, I have to offer a few caveats: I don't remember as much anguish or anger as I often expressed at the time, as I think I've had one of the least stressful transitions on record, for which I thank Beloved, my parents and children, friends, neighbors, co-workers and worship community; I'm impressed with how little I knew about how to do this and how well it went in spite of me; and Your Mileage May Vary. If any reader feels the need to take a similar road, take nothing therein as any kind of manual, but rather treat it as light fiction at best. Stylistically, I think the thing has problems: it's dreadfully serious and dirge-like in the beginning (see photo above) and then annoyingly chatty thereafter; attribute this to hormones if you like. Homecomings drifts from present tense to past and back again, and from topic to topic without warning. The chapter breaks make little sense. There's not much characterization and it's terribly self-centered stuff. But, then, if it lacked all these issues, it wouldn't be a diary of a personal journey, now, would it, dears? I have been to North Pacific Yearly Meeting of Friends, held at Reed College in Portland in the last week, and had a really wonderful time there, and a bit of what Friends call "deepening." Also a bit of stroking: lovely things were said to me by people who have been rediscovering me, and I felt really pleased to be me and not someone else, a feeling I'd been a stranger to for so many decades. I also managed to stick to the salad bar! Back at work and with Beloved, who stayed with her poultry and garden this year. We toured the garden, gathering some patty-pan squash for me to take in to work, and picked the first blackberries for her breakfast later. Some time was spent sitting, watching the growing things, which is almost a novelty now, and then I headed out to the Scriptorium to work on a project for RE. I did this for a few hours until darkness, aided by heavy clouds, had cloaked the valley, then settled down in the bunk bed to read, and when I finished my chapter and closed the book (These Are Real People by Rosita Forbes), a mouse on the shelf behind me was startled into leaping right across me, like a four-footed ski-jumper, into the middle of the floor, to run under the bed. Cute! Didn't know they could jump that far. Put the light out, turned over, and slept through the soft night rain. In the morning I discovered the wet grass, and tiptoed to the house between the spangled spiders' trampolines, noting that Beloved had brought in her bed from the orch-yard, and found her in the big bed. There was just enough time to curl up with her a bit before coffee. There's a little building out back, made up of recycled fence boards, which I originally built as a playhouse for the children, now all grown. It's now a fine scriptorium, where I write, and where I'm working on Renascence Editions and a HTML re-write of homecomings.doc this summer. Also taking a lot of naps. It's well ventilated and shady, and the quiet is interrupted only by the occasional redwing blackbird, or the footfalls of a visiting doe. While attending the Solwest Energy Fair (July 27th-29th in John Day, www.solwest.org) would likely be a lot of fun, another way to gain a lot of knowledge about alternative energy is to visit http://www.energytrust.org/. Energy Trust of Oregon was the main reason I am the proud owner of a 3000 watt photovotaic (aka solar electric) system. After much research, I concluded that the cost for the 1000 watt system I was seeking was just too much money, and too much trouble, to take on. In addition to the approximately $11,000 in materials costs, there were “hidden costs” of such things as building permits, electrical permits, ancillary meters, disconnects, ground rods, other whistles and bells, dealing with a reluctant power company, etc. And then there were the labor costs, if I chose not to do it myself. It would have taken me a whole lot of time to figure out how to put this whole mysterious solar project together. One year later, thanks to Oregon Energy Trust, and Oregon tax credits, I bought a system three times as big (3000 watts vs. 1000 watts) for a whole lot less money. After all was said and done, I paid about $7800 for the system. What’s really cool is that this system was turnkey; e.g. everything was taken care of by the solar contractor. I did not have to deal with the power company, nor the building department, or anyone else. I did not have to pay extra for meters, disconnects, nor any of the other hidden costs. Summary: Energy Trust got me a turnkey operation for $2.60 per watt, installed, whereas the system I’d investigated previously would have cost over $11 per watt, uninstalled! And it gets better: I recently got a bid to install another 2000 watt system on my roof, for a turnkey cost of $4000--$2 per watt. This is the best deal yet, and is partly due to the federal tax credit. I’ve been hearing rumbles of Oregon increasing tax credits, but can’t say for sure, but Oregon Energy Trust can, for sure. Check this out, people; my system has operated perfectly for the past 3 1/2 years, and has produced, as of today, 13,686 kilowatt hours of electricity-about five percent better than Oregon Energy Trust estimated for my site. For those of you who are concerned about global warming, it’s also prevented about 16,500 pounds of Carbon Dioxide from entering the atmosphere. The time for “thinking about” doing something is over. Time to step up to the plate: GO SOLAR! We have settled into our summer routine, carrying greywater to fruit trees, packing grass clippings around the trees and into the compost tumbler, watching to see how the ducks and chickens will fare with the imperious and quite territorial geese, and having at least some of our meals outside. 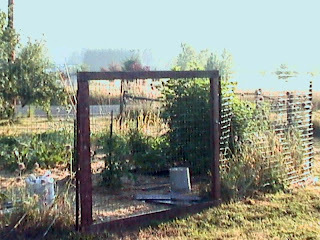 The gate for the deer fence is made with a frame of old cedar fence boards about seven feet square, filled in with the same fencing -- two rows of two by three inch mesh utility fence -- that went into the fence itself. The hinges are just baling wire wrapped around the framing and a fence post. The gate handle is a steel utility door handle that I originally bought to use on the house in Deadwood -- that would be 27 years ago now! Daughter and her Young Man brought over a rental truck today, and, with Last Son's help, we loaded her few worldly possessions into it --they only filled about half the truck -- gathered for a last meal of mostly pineapple and watermelon, and we reluctantly saw them off. Daughter now lives 100 miles away. Now that there is a little more space in the garage, it occurred to me to clean it up a bit, oil the press, and do a little volunteer work. I have thousands of small paper bags, left over from a project, and am imprinting them with "Safe Schools Are Everyone's Bag. pflag-es.org." 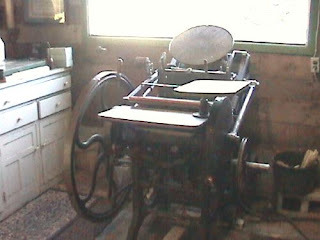 The press, a 10X15 Chandler&Price, was built in 1886. I got it with a high-torque low-speed electric motor that looks like it is from the 1930s -- the motor more or less died on me a decade ago, so to run the press, which I don't do very often, I have built a simple treadle, using a two-by-four hinged to the floor, which I am just strong enough to operate.